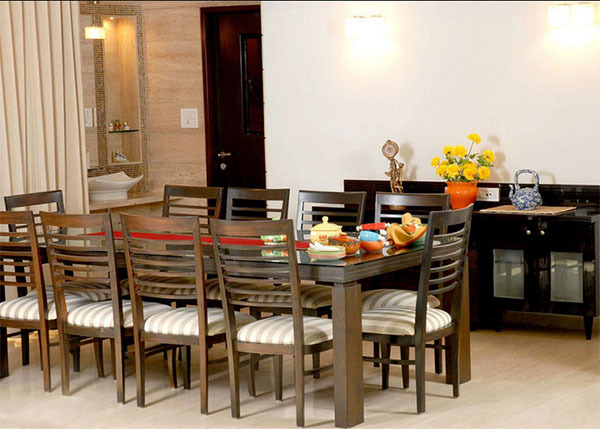 We have recently purchased a 1585 sqft apartment and it is in construction phase. I would love you to write a post about practical tips to be considered during construction of apartment. The smallest things which we miss during the construction and later regret of thinking about them during construction. When I was doing the house hunt series, this was the topic I was going to address the next. Better late than never as I get back to the topic. A few caveats before I begin: I’m no expert in architecture/interiors either by work experience or education. The suggestions you see here are what I have seen at homes of family and friends. Plan for the appliances you intend to keep in the utility – drier, washing machine, dishwasher and position the inlet/outlet pipes accordingly. Do you have an extended utility that is part of the kitchen? Decide where you will be placing the dishwasher – in the kitchen next to the sink, or in the utility next to the sink? You’ll have to plan for plumbing accordingly. A friend mentioned the challenges they faced in fixing the dishwasher. The height of the kitchen countertop and dishwasher were different. So, if you plan to have it next to the sink as part of the kitchen, then ensure your countertop height matches its height. Is there a wall separating the kitchen from the dining area? 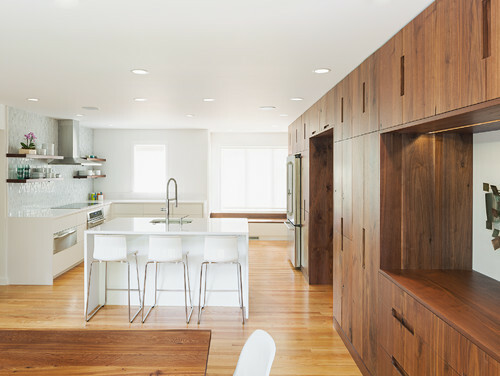 If you would like an open kitchen, knock off the wall, or tell them not to construct one. You can still make a wooden partition between the kitchen and dining area and use it as a pantry storage below and the top portion for crockery. Do you plan to buy an OTG? What appliances do you have? Best to have microwave and OTG on top of each other, with the baking essentials in shelves beneath them. Ensure there are enough plug points at accessible places based on the kitchen layout. Often times, you are forced to use an appliance because the plug point is there and not because it is convenient. For instance, if you are a family that uses the grinder often, it makes sense to have a small platform to keep the grinder with a plug point near it, instead of shoving it inside a cabinet. It’s easier to use and clean, without lifting every time. Hot water connection: given our climate, we don’t find the need to have warm water in kitchen taps. But, if you think you need, you may have instant hot water connection. Ask for a provision for the same. Chimney: ensure the outlet for chimney is covered with a mesh on the other end so that rodents and pigeons can’t find their way in. 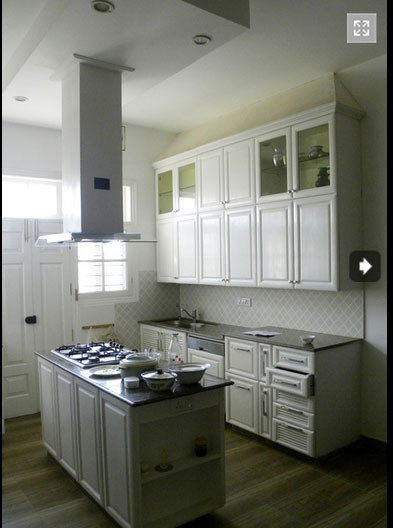 It would be best to ask the developer to hand over the kitchen without fitting the slab or tiles. You can do it along with the interiors. I’ll narrate what happened to us: the slab is too high for me even though I’m not very short.Moreover, as per Vaastu, it’s best that you face east while cooking, which means the counter-top should face west. But, who thought about directions or Vasstu then? They fit, and off they went. Once done, who has the patience to go through the whole process again when wisdom sets in! The common toilet in most homes is not used for bathing. So reduce its size and convert it into a powder room instead of a full-fledged bathroom. Makes it easier to maintain and keep it dry. The additional space you get from here can be used as a walk-in closet for the adjoining bed room, if possible. Check the layout of the toilet and if it is efficiently used space wise. One of the best ways is to line up wash basin, the toilet next to it followed by a glass partition for bathing. We got our tub removed because it may seem exciting but definitely is not from a maintenance perspective. Do not have a full glass partition. Half is good enough. Ensure at least 1 inch depth in the bathing partition so that water does not flow over the dry area. 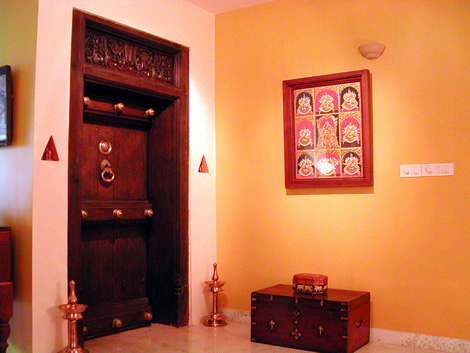 Is there a provision for pooja room? If you plan on having a cabinet-styled pooja, then it’s fine. But, if you intend to have it inside a small room which is not provisioned for, then it may call for changes during the construction phase – knocking off walls or providing an inlay wherever possible. As per Vaastu, one of the ideal directions is facing west in the north-east corner of the house, so that you face east while praying. Inlay in the wall outside the home or outside the pooja room. It was a tradition in South Indian homes (even today in many homes like my parent’s neighbours) to light oil lamps in the evening and keep them in this inlay. The shape is immaterial – it can be triangle or rectangle. False ceiling or LED? LED is the rage these days and you may have to ensure wiring along the ceiling. In one of the homes, I saw switches on the ceiling. Yes, on the ceiling – what if you have want to have a projector installed? Get a three rack slider for the windows, or ones with a provision for mosquito mesh. This will allow you to leave the windows open at night. Lofts: concrete lofts are out since it’s all part of wood work and flexible to move anywhere. But, if you have heavy stuff for storage it’s not a bad idea to get one done. Works cheaper. If it’s a duplex, then you may want to consider lights along the steps that will glow in the night. Check for wiring. 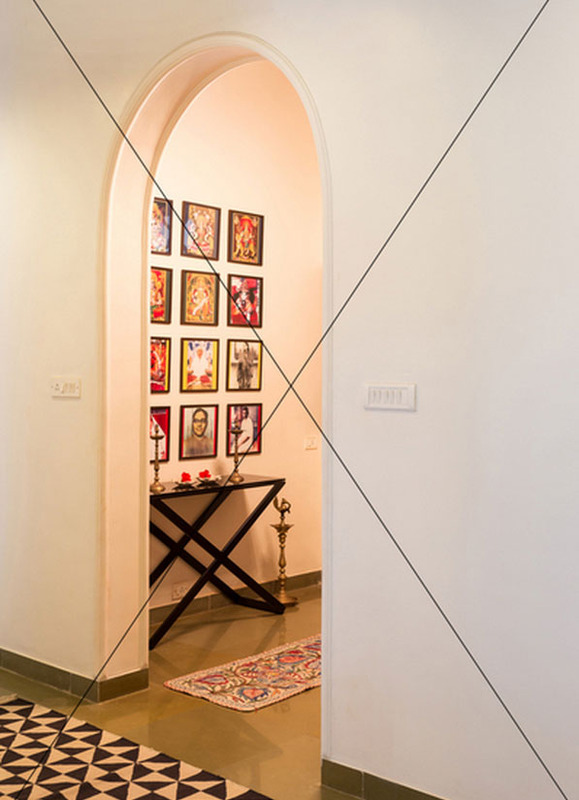 Archways for a traditional look? Check the size of the vitrified tiles the builder is providing. Bigger the size, lesser the joints, cleaner the finish. Don’t like the standard options the builder is giving? Well, you will have to make up your mind soon if you want to change the flooring. The options are endless from hardwood flooring to Italian marble and wood-like vitrified tiles. Choose something that fits your budget and easy to maintain. There is trend of going back to the old like oxide flooring traditional Chettinad/athangudi tiles. Ensure there is a water outlet with proper sloping in the balconies. If you think you need a grill enclosure or netting to prevent pigeons, it’s best to get it done during construction. If you plan on having a swing installed in the balcony or inside the house, get the hooks fixed. Thanks Lakshmi for the wonderful post. will keep in mind the above points during the construction phase itself and I really liked the cockroach point as we are suffering a lot in rented house now. You're most welcome, Raghavi. Thank you again for reaching out. Am so happy to know that there are traps for roaches these days!! There 're such a nightmare to deal with!!! 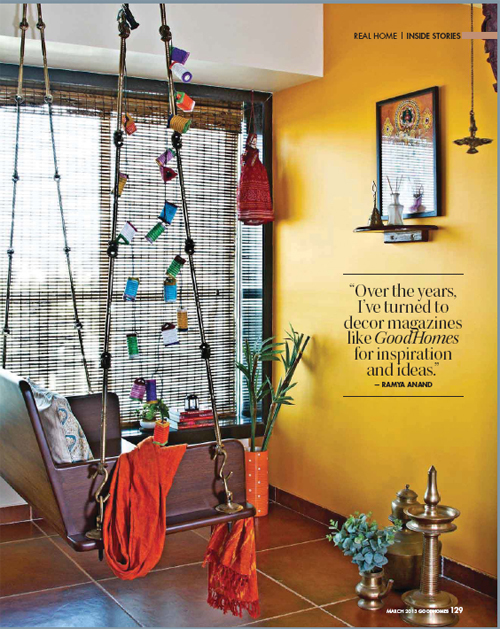 What is that shade and brand of yellow in the photo with the hanging bench? Raquel: I’m not sure. 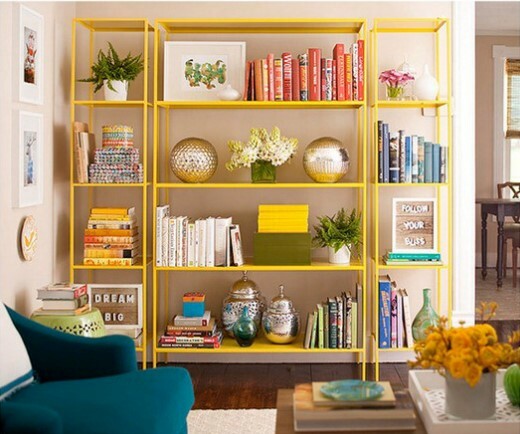 But it looks closest to Mango Mood from Asian Paints, a popular shade around that time.